Linz 2009 European Capital of Culture - The Foundation of Linz 2009 GmbH. 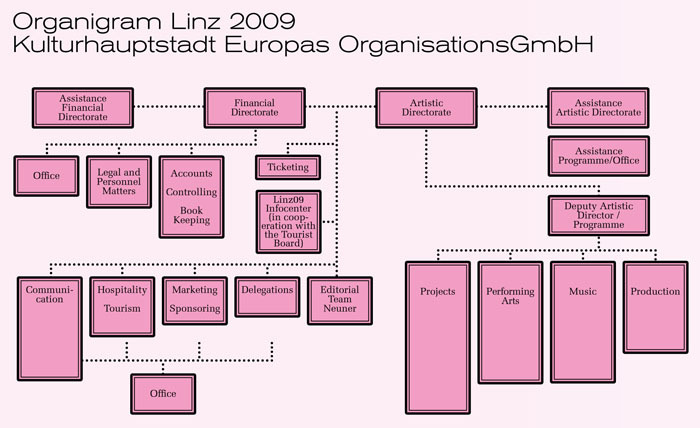 On 26 April 2005 the Linz 2009 – Kulturhauptstadt Europas OrganisationsGmbH (Linz 2009 GmbH) was founded as a 100% subsidiary of the City of Linz and endowed with the necessary funds by the Republic, the Province of Upper Austria and the City of Linz. In its choice of Artistic Director of European Capital of Culture Linz09, the City of Linz opted for Swiss cultural manager Martin Heller, who brought the experience of Artistic Director of the Swiss national exhibition, Expo.02, and of Bremen’s application for the 2010 title to bear on Linz09. Walter Putschögl, who had held a leading position in OÖ Tourismus until then, was appointed as Commercial Director. Both men began their work in autumn 2005. Ulrich Fuchs, a literary scholar, who had also been involved in Bremen’s application for the title of Culture Capital, joined the team in December 2005 as Deputy Artistic Director and Head of Programme Development. Appointing as artistic directors two men not previously associated with Linz enabled a fresh perspective on the city and an unbiased assessment of Linz’s resources. The directorate was completely autonomous in its decisions regarding programming and accountable only to the Board of Trustees. In addition to Martin Heller (Chair) and Ulrich Fuchs the artistic directorate came to include the Linz composer Peter Androsch, who was in charge of the conception of the music programme, and Airan Berg as Artistic Director of the Performing Arts in Linz09. With regard to Programming, Martin Heller and Ulrich Fuchs between them had adequate competencies in art, architecture, urban development, literature, education, higher learning, ethnology, sociology, history and politics. To make sure that the Performing Arts and Music likewise received their due in the programme they decided as early as 2006 to delegate these areas to experts, which appeared all the more justified in view of Linz’s location in terms of cultural geography: Linz is situated halfway between Vienna and Salzburg, two cities renowned for their music and theatre scenes. Given that Linz09 could not hope to compete with these meccas of music and drama on their own terms, it followed all the more urgently that the Culture Capital had to approach these areas in its own style, which involved creating something entirely new. In organisational terms the Linz 2009 GmbH consisted of the following units: Directorate, Project Development & Management, Music, Performing Arts, Communications, Marketing & Sponsoring, Ticketing & Marketing, Hospitality, Production, Delegations, Accounts and Legal Matters. The Chairman of the Board of Trustees of Linz 2009 GmbH was Dr. Erich Watzl, Deputy Mayor and spokesman for the City of Linz on tourism and culture. The Supervisory board, which consisted of thirteen members altogether, monitored all commercial proceedings of the company but was not entitled to interfere with Programming. Linz 2009 GmbH was also able to draw on an Board of trustees consisting of 68 personalities from the fields of politics, business, education and the media, chaired jointly by the Provincial Governor Dr. Josef Pühringer and Linz’s mayor, Franz Dobusch.